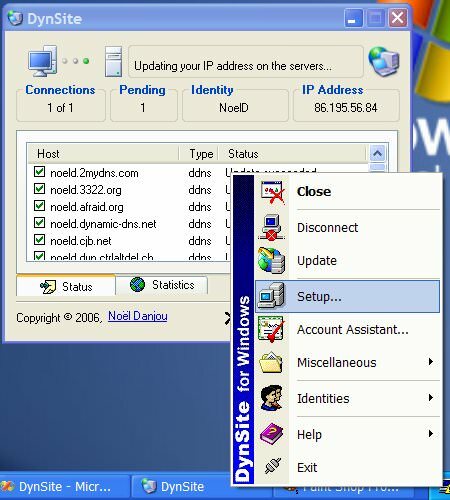 A dns file related to the DynSite and used for its plug-in files. What is dns file? How to open dns files? The dns file extension is associated with the DynSite a tool for Microsoft Windows operating system used to utomatically updates your dynamic IP address developed by Noël Danjou. The dns file stores plug-in for DynSite. DynSite automatically updates your dynamic IP address every time it changes on one or many dynamic DNS services or by email. This allows anyone to connect to the servers (Web, FTP, NNTP, etc.) running on your own computer using a fully qualified domain name (e.g. myhost.dyndns.org, where myhost is a name of your choice). Use DynSite to work with *.dns files. and possible program actions that can be done with the file: like open dns file, edit dns file, convert dns file, view dns file, play dns file etc. (if exist software for corresponding action in File-Extensions.org's database). Programs supporting the exension dns on the main platforms Windows, Mac, Linux or mobile. Click on the link to get more information about DynSite for import dns file action.